Map blooper stories are always good value, whether it’s because they’ve erased Wales or located Shrewsbury in the middle of a river. 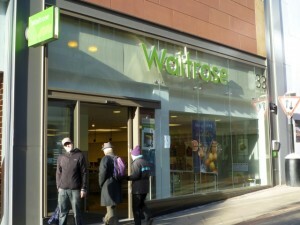 Now, potential John Lewis Partners in Lincolnshire may be disappointed to find that Waitrose is not, in fact, about to open a store on their doorstep. The Partnership’s jobs site highlights upcoming Waitrose locations, including the store in the upmarket Newcastle suburb of Jesmond that is due to open in November. The 7,500 sq ft shop will be the North East’s fourth Waitrose (after Hexham, Eldon Square and Ponteland), but the first to open under the ‘Little Waitrose’ convenience banner. However, it seems that not everyone at the Partnership is quite as clued up about the North East. According to the map, Jesmond has been shifted 116 miles down the coast, and is now somewhere near Grimsby in North East Lincolnshire. I know Grimsby is a major centre for the food industry, but surely the idea is to transport produce from there to the Jesmond store, rather than the other way round? John Lewis still haven’t corrected it – it’s getting embarrassing. I have similar experience to Paul. A couple of months ago my wife and daughter dragooned me into buying a new suit for her (my daughter’s) wedding. We first tried John Lewis (Newcastle) where, even though it was obvious that, for us – and especially me, this was a major purchase, the assistant appeared distracted and uninterested. My retail savvy female companions soon lost patience and we went to next-door Fenwicks where we were pampered and charmed into a (by my standards) very snappy suit that perfectly fitted the bill. Dear John Lewis; more staff needed, better trained too and if you want an example of attentive, friendly retail staff, try the checkouts at Asda and Morrisons. I’ve noticed a significant diminution in the overall quality of experience from both John Lewis and Waitrose over the past two years. I really worry that their aggressive expansion plans are a bit too much and that their customer service, training and internal policies and suffering as a result. 1. An increase in central control, issuing policies to all sites in a ‘one size fits all’ approach. This dilutes one key aspect that we all love about JLP, namely their local outlook, flexibility and customer service. 2. Increased pressure to find cost savings in order to remain competitive. Growth through debt is quicker but more costly. Growth means going into increasingly crowded areas so prices cannot go up, therefore corners (sorry ‘costs’) are cut instead. I agree that the map you show here is an amusing faux pas, but when I take into account my recent poor experiences (all of which have been recognised by JLP as being falling short of their own standards) I’m afraid I see it as yet another example of the slow demise of our most loved and historic retailer. There is time for them to stop the rot before they get in too deep – I only hope they can.